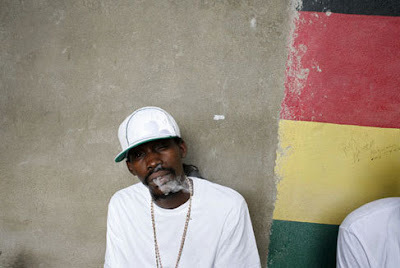 The Lime: Munga says he was arrested for "One Little Splif"
Damian Rhoden aka Munga Honurable recently made headlines for his possession of ganja and an offensive weapon in November of 2009. He appeared in court on Mionday March 22, 2010 where he was fined $2,100 JMD or face 20 days in prison. The fine was paid and he has since been released. After his arrest, Munga went straight into the studio with Jammy James aka Jam 2 & Camar Doyles aka Flavaunit of JAM 2 Productions to record a single about his arrest and subsequent charge. The single is entitled "One Little Spliff" where he explains the encounter with the police officers and his experience in court. Jam 2 & Camar's production is a sweet reggae one drop ballad that opens the listeners ear to lend solace to Munga's lyrics and melody. The single has since been released on Friday March 26, 2010 and is expected to receive continuous play both on the radio as well as within the dancehall with it's melodic sound and vintage flavor. This release is the second release between JAM 2 Productions and Munga for 2010, as earlier in March, the two released "Music In My Head" which is currently enjoying favorable radio play on all major radio stations. 2010 has started out very well for the JAM 2 Productions duo who have since released singles such as "All Is Well" by Pressure Buss Pipe, "Move Dem Up" featuring Delly Ranx, Camar & Docta Bird to which a music video will be shot very soon, as well as "Muscle Control" by Camar featuring Lady Saw. The JAM 2 Productions duo will continue to release singles throughout the year and we expect more hits from the camp.